Wow what a first day! Today we embarked on our trip to Budapest for the 2018 Study Session with the European YWCA and the Youth Department of the Council of Europe. The topic? 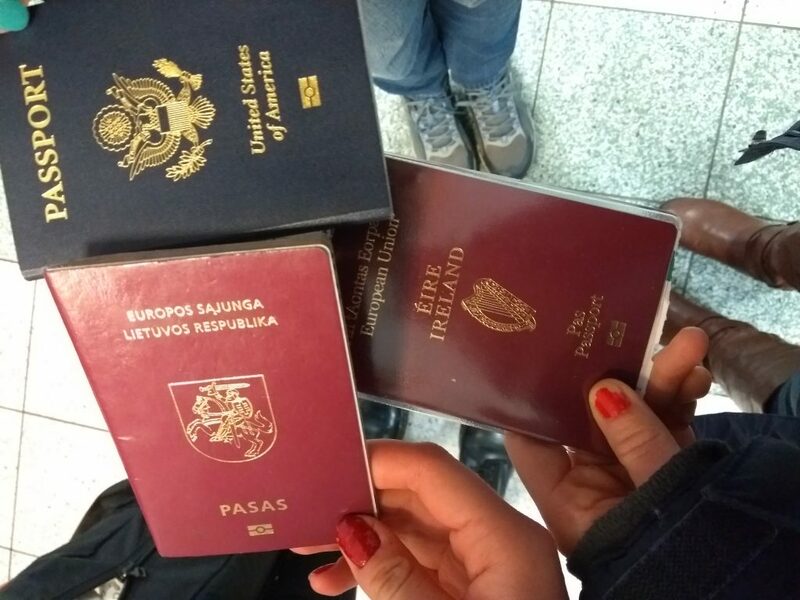 Leading Change for Young Women Migrants and Refugee Rights Across Europe. This is obviously a very current issue and one in which we are all very passionate about. We didn’t expect to see snow on the ground when we woke up this morning! Upon viewing it we’re met with feelings of anticipation. Will our flight still go? Will we be able to get to the airport OK? However, even the snow couldn’t dampen our feelings of excitement at today finally being the day that we get to travel to Budapest! 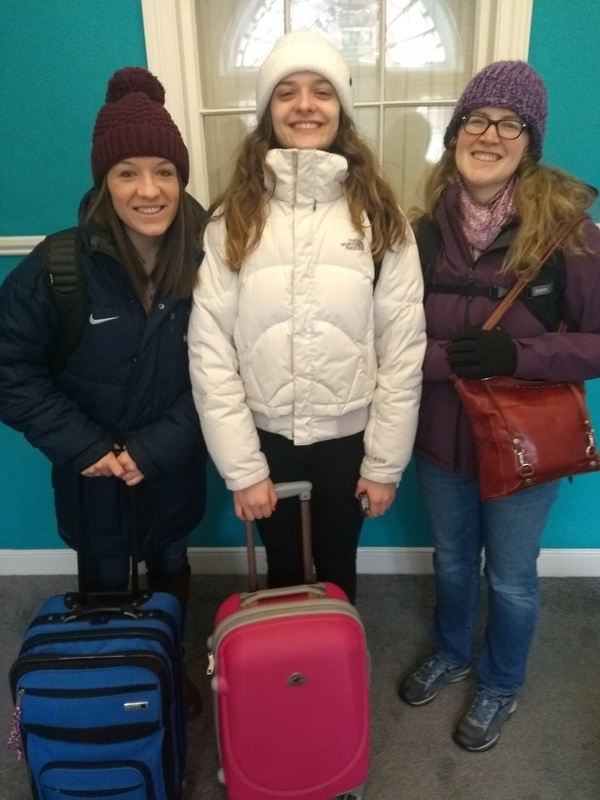 We left YWCA Dublin at 11 o’clock, trudging our wheelie bags through the snow (Brittany was the only smart one who had packed light and fitted everything in a backpack). 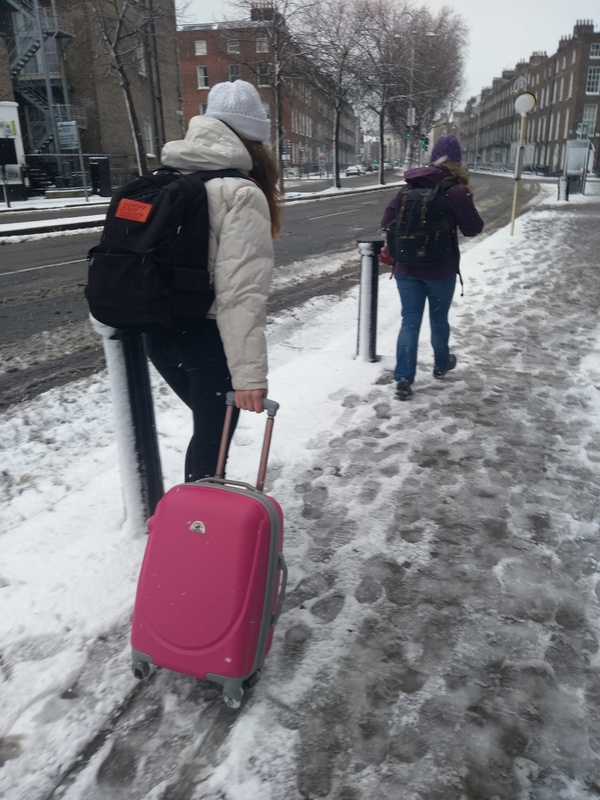 The snow continued to fall beautifully around us as we walked and talked and we caught the Airlink bus to the airport just opposite Pearse street station. Evita and I were glad to no longer have to wheel our cases through the snow!!! Everything was going smoothly and we even had time to grab a sandwich at O’Briens for lunch before we went through security (priorities!!) but then our flight was delayed due to the snow so we were sitting on the plane for an hour and a half before we were able to take off. Some of us slept (I am definitely the guilty party) and some of us read and listened to music. We were very glad when the plane took off at 3.45 p.m.
We arrived into Budapest at 7:45 p.m. and got a minibus to the European YWCA. Our driver was lovely and we managed to see some beautiful sights as we drove – firstly McDonald’s, Burger King, and Starbucks are everywhere, and secondly the Parliament building on the Danube is an amazing sight at night. When we arrived we checked in and got into our rooms. We were very glad to hear they had saved us dinner because our sandwich at lunch time seemed a very long time ago!! After we ate we joined some of the other participants at the welcome evening where we got to meet each other, mingle and enjoy some drinks and snacks as well as go over some logistical details. We met people from Scotland, Greece and Armenia! We are really looking forward to learning, growing and experiencing this journey alongside many other young women from around the world! We’d love you to follow our journey as we represent YWCA Ireland at the Study Session in Budapest! Follow us on Instagram @ywcaireland, Twitter @ywca_ireland and Facebook: YWCA Ireland!